Frehiwot Negash picked up the phone and called a random number. The Ethiopian finance manager was trying to test if indeed she could now place a call to Eritrea after 20 long years of being cut off from the neighboring country in the aftermath of a bloody border war. The person on the other line answered. It was a hotel. Negash says she now plans to visit Eritrea later this year. After it was announced on Monday that phone lines would be restored between both countries, Ethiopia’s telecoms company, Ethios, sent text messages to its 57 million subscribers, saying they could now call Eritrea. Negash was one of the people who quickly picked their phones to check if it was true. She and others in Ethiopia spent the day placing calls to friends and long-lost family members in Eritrea. And the occasional stranger too. “Oh gosh, I am so excited over this EthioEritrea thingy, I just called on a random number in Asmara and had a nice chat with a lady named Frtuna and she speaks Amharic,” Twitter user Henok Karvonen posted. It has been 20 years since a war led to a shutdown of communication between the two countries. 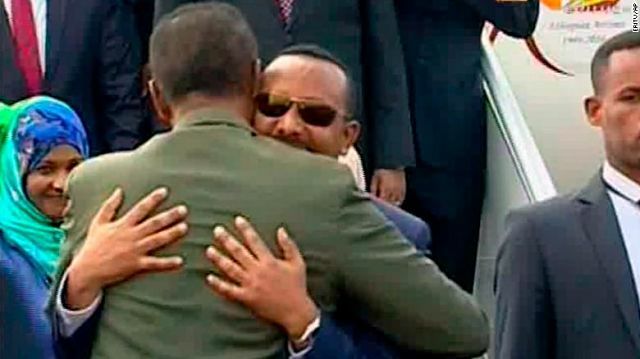 But a diplomatic breakthrough was reached this week following a two-day summit between Ethiopia’s new Prime Minister, Abiy Ahmed, 41, and Eritrean President Isaias Afwerki, 71, in Eritrea’s capital, Asmara. The two leaders delighted their citizens after declaring an end to the war between both nations on Monday.